Our comprehensive refurbishment programme not only restores paving and other hard surfaces to close to their original condition, but can also when combined with the sealing and other surface treatments further enhance their appearance and durability.We provide a pressure washing cleaning service for driveways, pathways, patios and other areas of residential and commercial property. 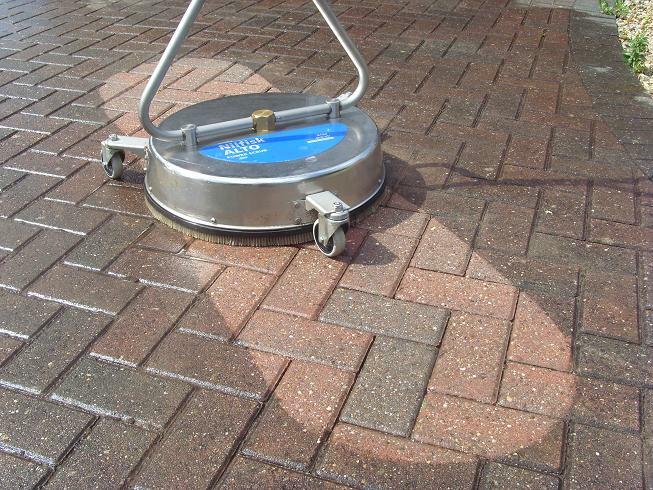 Any hard landscaped area made up of block paving, tarmac, concrete, or other stone surface is suitable for the pressure washing cleaning processes that are offered. 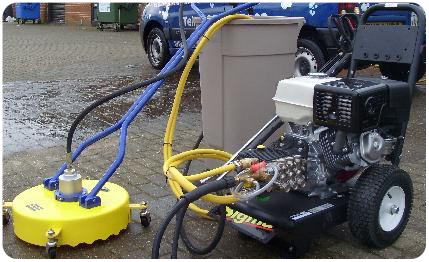 The high-tech pressure washing equipment we use (250 bar with a wide range of tools), is vastly superior to domestic pressure washers and enables us to operate more quickly and efficiently with less collateral mess to surroundings. Each customer’s requirements receives individual attention with tailored solutions to their cleaning problems, which achieve the desired objectives with minimum disruption and cost. After cleaning customers may choose to have selected paved surfaces sealed. Effectively we provide a consultancy business that provides each customer with the best action plan to achieve their improvement goals. Following the logical series of steps given in the list opposite ensures customer satisfaction. Please select the Use of Sealants and Tarmac and PIC pages for details of the processes used and to see examples of the excellent results that these treatments deliver.